Ranglong is a Kukichin Language. It is one of the sub-tribes of Halam community of Tripura. The Ranglong language has close affinities with many other Tibeto-Burman languages like Aimol, Chiru, Kharam, Darlong, Molsom, Hrangkhol, Bongcher, Kuki, Mizo etc. Ethnically, they are mongoloid and their language belongs to Kuki-Chin sub-group of Tibeto-Burman language family. The speakers of Ranglong are mainly found in Dharmanagar, Khuwai, and Dholai Districts of Tripura. They are also found in small scattered groups in Manipur, Mizoram and Karimganj and Dima Hasao Hill Districts of Assam. Besides this, a handful of Ranglong speakers are also found in Chittagong hill tracts of the present Bangladesh. The population of the Ranglong tribe cannot be ascertained from the Census report of India as they are not reflected in the same because of its negligible numerical strength. However, the total number of Ranglong speakers in Tripura is estimated around 7000. Bradely (1993) classified Ranglong (Langrong) under the Old-Kuki groups of Tibeto-Burman branch of Sino-Tibetan speech family. Ranglong families are patrilineal. 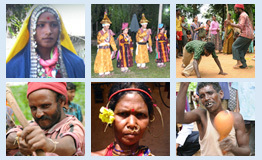 The Ranglongs are unlike other hill tribes of Tripura found in both urban and rural areas. Since they have been living in the midst of urban population for many years as a result of this they gave up many traditional practices. But in rural areas the traditional houses, art and craft, agricultural activities, hunting, fishing, weaving etc are still found among the Ranglong People. Traditionally they are animist. They are the nature worshiper. They believed in the religion of their ancestors that means the religion of grandfather and grandmother. They are very rich in worshiping of god and goddess. Their religion is based on the belief of supernaturalism, out of fear of their sufferings and death they offer all kinds of foods, and scarified animals to the sprits. They believe that these sprits cause them their sickness and death and all sorts of misfortune behind them. As a result of it they worship Apuiasang, Debac, Tasarai etc are their family deities. They worship Alamangai, female god is worshipped during pregnancy. Besides they celebrate Durga Puja, Kali puja, which are considered as a supreme god of heaven. The unique ethno-linguistic feature of this tribe is that they believe that the influence of their song will impress the God of Rain every year to give sufficient rain to them as well as to the world. The Ranglong tribe is still in infant stage in terms of its available written literature. No scientific or systematic study has been done on Ranglong language by any linguist or scholar. The following are the major works found in the language that includes: Grierson’s Linguistic Survey of India Vol. III part II, (1903). In the Linguistic Survey of India (LSI), Grierson offers a brief introduction of Ranglong (Langrong) people and very few grammatical sketch of Ranglong along with some text data. The other book is of D.N. Goswami, the Ranglongs of Tripura (2004) which provides a brief socio-cultural sketch with few vocabulary of Ranglong language. Presently, we are working on the Ranglong Language for preparing Ranglong Sketch Grammar which includes phonology, morphology and syntax. The work will also emphasized on Ranglong-English-Hindi dictionary along with the ethno linguistic information.